To lose weight, you need to eat fewer calories than you burn. A 1,200-calorie diet is a low-calorie diet that can help both men and women lose weight. The Indian diet is filled with nutritious foods, including grains, legumes, vegetables and dairy. You can lose weight on a 1,200-calorie Indian diet by controlling portions and eating more whole foods. When following a low-calorie diet, it's important to eat regularly for hunger control. Your 1,200-calorie Indian diet should include three meals and two snacks. To keep calories under control, each meal should contain around 300 calories, leaving 150 calories for your snacks. Your diet should consist primarily of fresh fruits and vegetables, whole grains, legumes and low-fat dairy, as well as eggs, poultry, seafood and lean meats if you include them in your diet to make sure you meet your vitamin and mineral needs. A healthy Indian breakfast might include unsweetened tea made with 1 cup of nonfat milk with two servings of a starch such as two idlis or two slices of whole- wheat bread with one serving of fruit such as a small banana or orange for 310 calories. If you are not a vegetarian, you might enjoy one egg scrambled with two slices of whole-wheat bread and a cup of unsweetened tea made with 1 cup of nonfat milk for 325 calories. A healthy vegetarian Indian lunch might include 1/2 cup of mung dahl, 1/3 cup of cooked brown rice, 1 1/2 cups of cooked broccoli and cauliflower and a medium peach for 295 calories. A nonvegetarian Indian meal on a 1,200-calorie diet might include 3 ounces of tandoori chicken with one 6-inch whole-wheat roti and 1 cup of salad greens topped with 2 tablespoons of low-fat dressing for 315 calories. 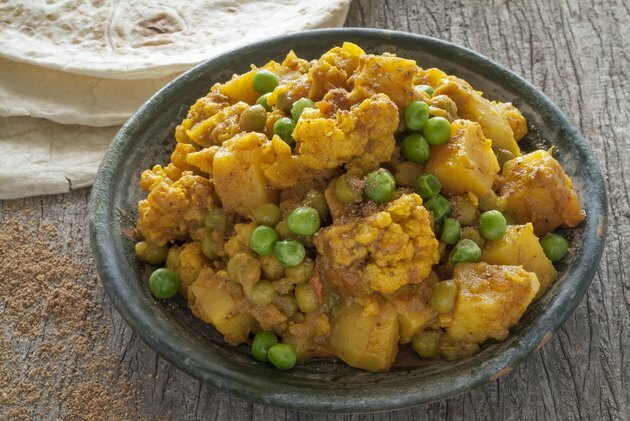 For dinner, fill up on 1 cup of low-fat potato subji with 1/2 cup of chickpea curry and 1 cup of cooked mixed vegetables such as carrots and green beans for 290 calories. A low-calorie Indian meal with meat might include 3 ounces of lamb curry made with 1 teaspoon of vegetable oil, 1/3 cup of brown rice and 1/2 cup of mixed vegetables for 315 calories. A snack on your low-calorie diet boosts energy and quells hunger pangs. Healthy 150-calorie Indian snacks might include 3/4 cup of plain low-fat yogurt with half of a whole-wheat roti, 1 cup of nonfat buttermilk with half a mango, 30 unsalted peanuts or 1 1/2 cups of puffed rice with three dates.